More than 1,300 large U.S. electricity users, including 78 Fortune 500 companies, belong to the U.S. Environmental Protection Agency (EPA) Green Power Partnership. Partners pledge to use, at a minimum, green power for a specified percentage of their electricity use. For members using the most electricity, program requirements mean that at least 3 million kWh of the electricity that they use each year be green power. Most partnership members exceed minimum requirements. In fact approximately half of the partners purchase and / or generate renewable power for 100% or more of their electricity needs. 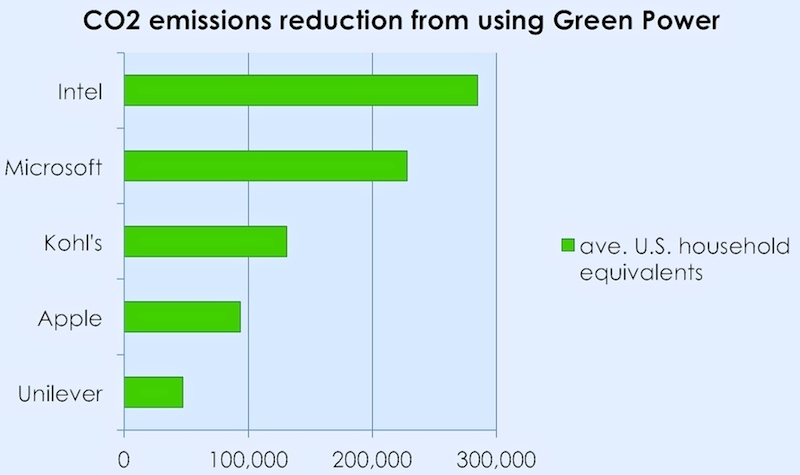 The total CO2 emissions avoided by the largest five users, because of using “0-carbon” green power rather than conventional electricity, is equivalent to the CO2 emissions generated by the electricity use of approximately 785,000 average U.S. households, based on USEIA data. According to program definitions, green power is power generated by solar, wind, geothermal, biogas, and eligible biomass and low impact hydro sources. Green power “products” can be utility delivered electricity, renewable energy certificates, or on-site generation. However it can only come from renewable facilities installed within the last 15 years and must be in addition to any renewable electricity included in standard electric service.